The study indeed assumes that the all of the variability in the base periods is natural. Therefore the climate noise in the projections is exaggerated. The evolution of the trajectory comes from the superimposed temperature trend and the model sensitivity. As you can tell, the model quickly forgets the initial conditions once the artificial atmosphere is introduced. So the noticeable break in the surface temperature changes doesn’t last very long. Since the projected surface forcing changes come from a climate model(s) the underlying assumption is that the important ice-ocean feedbacks are captured in the superimposed forcing changes, so it really isn’t an independent test and not meant to be a substitute for a coupled model. This experiment simply shows that having a more realistic spatial distribution of sea ice doesn’t alter the results very much. Yes, but that also involves “forgetting” half the total warming from 1948 through to the present! That is, it “forgets” the initial 2009 temperature and drops down to the temperatures you’re feeding it (plus the additional exogenously-added trend). 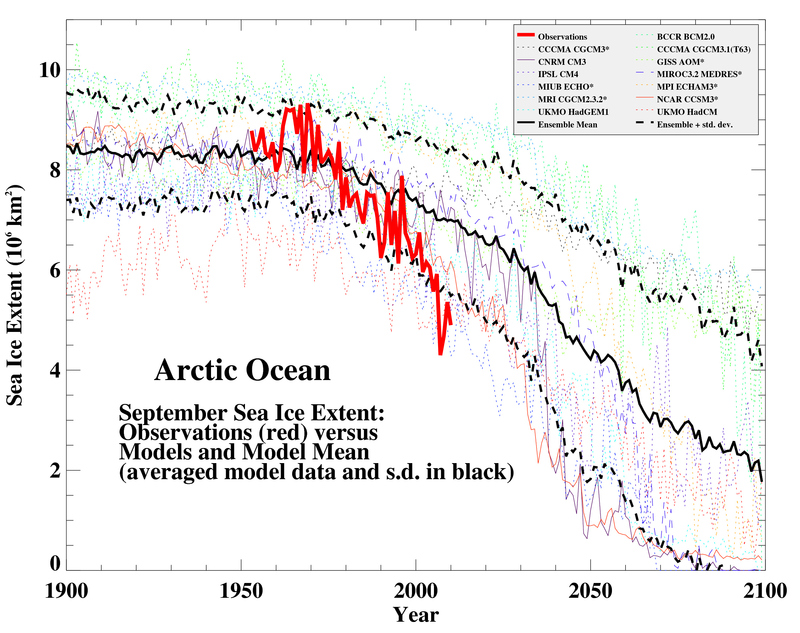 So yes, if you “forget” that the Arctic has already warmed several degrees, the ice tends to remain. the noticeable break in the surface temperature changes doesn’t last very long. I disagree vehemently. In the B2 run, the SAT trend in the projection NEVER gets back up to the 2009 value, and only 4 individual years in the entire run are above the 2009 value. Since ice response at the end of summer is the integral of meteorological forcing, getting the timing of individual weather events correct is not required. Using a range of summer climatological weather distributions is not too poor an approach for a probability outlook. For the Holocene, the warmth of today is NOT separate from the warmth 8kya. Instead, it is laid on top of. Put a fire under some water, and it doesn’t boil… does that indicate that placing a fire under water for a longer period won’t cause the water to boil? The previous ice ages are another matter, of course. Then again, they’re not nearly as constrained. Also, natural interglacials are slower than the current events and clathrate atmospheric CH4 emissions are limited by the capacity of ocean organisms to consume CH4, so exceeding that limit is more of a potential problem today. A big natural release over 1,000 years might result in ~0 atmospheric CH4 increase. Do the same today in 50 years, and CH4 could increase tremendously. The big question in my mind is whether the potential release is self-limiting. The gulf oil spill involved clathrates. They tried to cap the leak, but expansion caused freezing and clathrates gummed up the works. Will that happen naturally so leaks will self-seal? Now this is the worst captcha I’ve ever seen. The first half HAS NO LETTERS! Just a picture. Just how am I supposed to represent that??? Please please PLEASE dump your current provider and get a system that allows humans to post relatively easily. 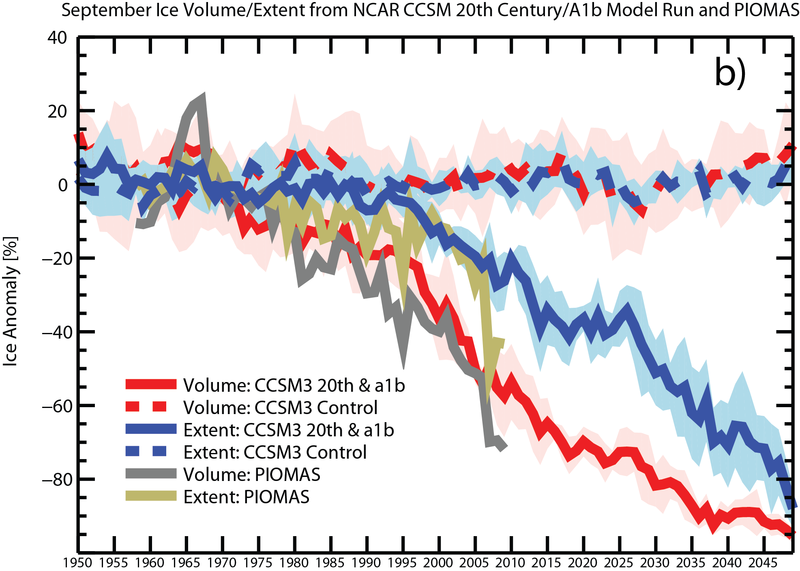 Clearly, the sea ice volume data plot is the single most important topic of discussion, yet in the article it is shown in Figure 1 with a poor vertical scale and amongst linear trend lines which mislead and make the curve appear to be linear and reach the zero point far out in the future. The data does appear also in Figure 3 and with an exponential fit although in this figure the data is somewhat concealed amongst a plethora of other curves. It is important that the readers see the data clearly displayed, for this I would refer them slide 24 of the presentation: http://www.cmos.ca/Ottawa/SpeakersSlides/PaulBeckwith_19Jan2012.pdf ,one can clearly see that a linear trend line to the data makes no sense. In fact I asked my 9 year old where the curve is trending to zero, and he correctly responded 2015, as most people would conclude. It is important to note that the PIOMAS volume curve is for Pan-Arctic ice, the prefix indicating that it includes ice outside the Bering Strait into the Pacific. It is clear that this ice will melt every year, so the actual volume withing the Arctic proper is even less than the data indicates. The ambiguity over the definition of ice-free is not really important as far as the strong albedo feedbacks magnifying the warming of the region, so is kind of a red herring in the discussion. How can anybody have much confidence in the so called “published projections” for the ice free state between 2037 and 2100, given that these projections have been wrong every single time they have been made over the last decade or more; they missed the collapse in area in 2007 and they also missed the exponentially declining behavior over the last several decades. Invoking the natural variability explanation for making a prediction based on so called “simple extrapolations” is also a very dubious claim. Simple physics dictates that with less sea ice there is magnified warming of the Arctic due to powerful albedo feedback; this in turn reduces the equator to pole temperature gradient which slows the jet stream winds causing them to become more meridional; this combined with 4% more water vapor in the atmosphere (compared to 3 decades ago) is leading to much more extremes in weather. There is nothing “natural” about these extremes of weather over the last 2 years, or about the unprecedented ozone hole in the Arctic last year (troposphere warming from greenhouse gases caused stratospheric cooling to below threshold temperature for polar stratospheric cloud generation and ozone destruction). Neither is there anything natural about the large variation in the Arctic Oscillation (AO) from record positive to record negative levels). Ditto with the rapid increase in methane emissions from the Arctic region as flask measurements indicate, as well as satellite measurements. Both methane datasets show a very large increase in methane in 2011 versus 2010, this is also confirmed by Russian measurements on the East Siberian Arctic Shelf (ESAS) which saw methane plumes of 1 km in diameter when a year or two previously the plumes were a mere tens of meters in diameter. Click the little icon with the two circling arrows for a fresh choice. This is a fast changing “arms race” — well funded spambot herders (Motto: “We will bury you! In Spam!”) versus websites. None of the responses are easy; I’m seeing more sites give two or three different challenges per post. I’m also seeing small websites simply choked to where the owners give up. Excellent posting. All your points support AMEG’s assertion that we have a planetary emergency on our hands. But what do we do about it? Clearly the Earth System will not return to any kind of normality (hospitable for humans) without intervention. If we let the sea ice disappear completely and the methane rip, then we are sunk. So we have to take some measures to cool the Arctic. And we have to do it on a large scale, so it involves geoengineering – preferably using a number of techniques in combination. But we can take immediate measures to avoid the risk of inadvertent warming, e.g. from gas or oil spills. And we could even allow more sulphate aerosol into the atmosphere, as this has proven successful at global dimming – taking care about not to release “pollution” near centres of population where it could damage health. I’m sure there are other things to do if we put our minds to it. Necessity is the mother of invention. Concerning predictive functions: With something wobbling so much up and down as the volume curve, just putting your finger on the screen and drawing a freehand curve is not less precise than any fit function, much more economical though. Axel Schweiger wrote, that we had just a couple of warm springs, which caused the deviation from the GCM predictions, and this is one interesting point: Is this “couple o’ warm springs” really something coming and going like any cyclone, or is it a sign of a changing weather regime with stronger mixing and stronger heat transport? There are arguments for the latter, e.g. change in jet stream trajectory (http://nsidc.org/arcticseaicenews/category/analysis/). For the time being we cannot be sure, but this might be an effect escaping the GCMs so far. Paul Beckwith, I would also beware of invoking “simple physics” in making predictions about a complex system. Gavin has already pointed out that ceteris probably ain’t paribus, as there could be negative feedbacks due to clouds that diminish the positive albedo feedbacks. I agree completely that with the fluctuation in the volume curve one can eyeball the curve and do a decent fit, in fact my 9 year old son said it looked like the zero crossing was at 2015. Not necessary to get a room full of Ph.D.s to see what the trend is in this case. I disagree completely with the Axel Schweiger “couple of warm springs” explanation to describe the last few years. In fact in my presentation( http://www.cmos.ca/Ottawa/SpeakersSlides/PaulBeckwith_19Jan2012.pdf )on slides 26 through 45 I discuss how the extreme weather is a pattern and not an anomaly, and how meteorologist Jeff Master is going ballistic about the last two years, as is ClimateProgress blogger Joseph Romm (quotes on slide 45). I am sure this is a pattern and not a simple excursion from the norm, as is James Hansen. Particularly damning is Hansen’s climate dice analysis showing the spatial distribution of heat events around the globe in standard deviation units (slide 42); the enormous increase in heat events exceeding 2 sigma and 3 sigma within the last decade show an undeniable pattern of increasing extremes. Clearly, these extremes are global and nature and there is every reason to conclude that they will increase in frequency and intensity as the sea-ice collapses further. The main question is when will these extremes hit the global food supply and cause shortages, just this week there are articles about how China’s rice and grain crops are being stressed by flooding and drought events. Remember that when the jets stayed in a stationary meridional blocking pattern for about 5 weeks or so over Asia a few summers back Pakistan was flooded out (being in the trough) and Russia was baked and burned (in the ridge), the grain crops were hammered there so much that there were no exports from them that year. The same meridional blocking pattern hit North America this March, keeping the East at record high temperatures and the West colder than normal such that it snowed in Northern California and also rained much more than normal. What more do we need to be sure? I do not buy the blanket statement that the climate system is all complex. There are “core” linkages that the physics clearly explains with absolute certainty and of course there are many “peripheral” connections where things get more complex and obscure. For example simple spectroscopy dictates that the CO2 molecule vibrates, stretches, and rotates creating quantized absorption lines that are Doppler broadened and pressure broadened and absorb the infrared radiation coming from the warmed planet. Snow and ice has a high albedo and when it is replaced by sea water or soil and tundra the albedo drops and there is warming, this is simple optics. Slide 8 of http://www.cmos.ca/Ottawa/SpeakersSlides/PaulBeckwith_19Jan2012.pdf shows the spatial warming, the Arctic amplification of the warming is enormous and is due to this “core” albedo effect. Sure, there are some negative effects from clouds but they are clearly not preventing this large latitudinal amplification effect. I should qualify that I have a multidisciplinary background with an undergraduate degree in Engineering Physics and an M.Sc. in laser physics, an I am working towards a Ph.D. in abrupt climate change in a Geography department, however this has not stopped me from sitting in on many human geography and policy courses. I completed all the courses required towards a Ph. D. in physics, and I have audited many courses in Earth Sciences and mathematical physics. #155–I’m sympathetic on several counts. But the March heat wave was not a global phenomenon; NCDC has March as the 16th warmest ever, and the coolest since 1999. (Still warm in the big picture, but far from remarkably so by 21st century standards.) Citing it in this context just weakens your case. Detectability may require new tools though. While the mean shift argument works well for NH summer, in the spring we often speak of a phase shift such as an early spring or summer come early rather than a mean shift. The shift in the mean for spring is about the same as for summer but the variiance is much larger in the spring so the attribution argument that works in the summer does not work in the spring. I suppose shifting hardiness zones is one quantification but something that captures just how wild March was seems a little hard to find. Ah, would you claim that acid rain and mercury “pollution” (your quotes) only affected humans in centres of population, not lakes and streams and soils downwind for hundreds of miles? Oh, wait. That industry argument failed 40 years ago when the science showed it was bogus. Do you have a reference for this statement “combined with 4% more water vapor in the atmosphere (compared to 3 decades ago) is leading to much more extremes in weather. Should that be happening this time of year? Shouldn’t increasing sun be oxidizing the methane? Am I missing something here? Paul Beckwith, The statements you are voicing are not based on evidence. They are opinions. They may be correct. There’s even a reasonable probability that they are so. Nonetheless, they do not change the fact that there is a whole helluva lot we don’t understand about what is going on in the Arctic at present. Very little is clear, and none of it is simple. That is not something from which to draw comfort. Huh? Dude, are you suggesting that melting of ice and clathrates is not a thermally driven process? You’re pointing to one image deep down in their large file system. That’s their ‘front door’ — it’s often the case that one of the pages linked to a public front door invites questions about the site. It’s not a published source from a scientific journal, but it is an interview with a major climate scientist, Kevin Trenberth. It’s the most recent image they have of methane above the north hemisphere. And thanks for posting their ‘front door,’ but is there something in particular you wanted me to see there? Could I just ask the good and informed folks here, from what people know about methane, is this what we should expect to see–increasing amounts in the Arctic in March? I have followed ice news closely over the last 3 years and I am worried about future ice loss. But can anyone explain how we have had previous ice free occurrences in the last 100 years or so. If I understand correctly then 1934 or 1953 were “ice free” or very low at least. The problem is that if this is true then public opinion is less likely to be too concerned with it happening again. Also, it appears by looking at the antarctic ice graphs that the antarctic is doing well and has if anything slightly increased over the last 30 years or so. Wouldn’t we expect this to be behave in similar way to the arctic? Andrew Holder, are you the same Andrew Holder who has had some comments at Wattsupwiththat? If so, it explains your confusion. When you go there, you are fed so often with misinformation, it is difficult to enter back into reality. Andrew, this claim is flat out false. I’ve seen the 1934 claim before, but never supported by anything other than fragmentary anecdotes–and actually, IIRC, “anecdotes” is a generous description; “a single vague reference” would be more like it. I could keep going, but I think you get the point: there is no evidence whatever of ice-free periods in historical times, and a great deal of evidence showing the opposite. no, this observer, at least, really wouldn’t expect them to behave in a similar way at present. Yes I am, i know it’s strange to some people but I like to read and digest information from all sources and then make up my own mind about things.I think it’s a sensible question to ask why antarctic ice is increasing when arctic ice is decreasing but I understand that might be a topic for another post as it will probably, as Gavin indicated, involve many different areas for discussion. As for previous years when arctic was “ice-free” i think one of these possible sources is from old pictures of submarines or ships being “photographed” at the North Pole, eg in 1958 http://en.mobile.wikipedia.org/wiki/USS_Skate_(SSN-578) although I understand that this has been open to debate. As in all these things, nothing is black and white – even in old photographs! As other posters have pretty much scuttled the Arctic portion of your concern, I will confine myself to the Antarctic. There are a lot of things that folks seem not to understand about the poles. The first and perhaps most important is that while they are warming, they are still bloody cold–especially in winter–and hence, ice will still freeze. In Antarctica, this means that cold and moister air from the surrounding oceans will blow over the interior and fall as snow, so increasing ice mass is to be expected. It is along the edge of the continent where we are seeing deteriorating ice conditions. Ice shelves are collapsing. That is not healthy. Agree on all points. Two different regions. In “The Early Twentieth-Century Warming in the Arctic—A Possible Mechanism” BENGTSSON 2004 , they wrote “The largest warming occurred in the Arctic (60–90N) (Johannessen et al. 2004) averaged for the 1940s with some 1.78C (2.2C for the winter half of the year) relative to the 1910s. As can be seen from Fig. 1, it was a long-lasting event commencing in the early 1920s and reaching its maximum some 20 years later. The decades after were much colder, although not as cold as in the early years of the last century. It is interesting to note that the ongoing present warming has just reached the peak value of the 1940s, and this has underpinned some views that even the present Arctic warming is dominated by factors other than increasing greenhouse gases (Polyakov and Johnson 2000; Polyakov et al. 2002). #172 Andrew’s source? Would it be the Larsen taking 2 years to sail through the NW passage, instead of less than a week now a days??? Or is it some secret Nazi Arctic submarine navigation chart smuggled to Argentina after the war, the U-boats needed to surface often for air, and it was so ice free they had a regular sub charter schedule to Japan. By the way the same war in the 40’s during which the 3rd Reichs war machine froze dead on its tracks just short of Moscow??? No no, lets see, must be something more obvious… Please elaborate! But be warned, there is no such memory of such warm times by the people of the Arctic, sorry that there was no weather stations, but there were people here, currently entranced by a real current warming period. Then go get this data and plot the temperature for the Arctic. By the way, that picture which is supposedly of the submarine U.S.S. Skate surfacing at the north pole in open water … as it turns out, it wasn’t taken at the north pole. “… A knot of sailors in the control room stared intently at an instrument inscribing patterns of parallel lines on a rolling paper tape. The pattern looked like an upside down mountain range. “Heavy ice, ten feet,” said one of the sailors. Calvert turned toward the man in charge of the ice-detecting instrument. “How does it look?” The sailor flashed him the okay sign. “Bring her up slowly,” Calvert said. The three-thousand ton sub began drifting upward like a giant balloon. The diving officer called the depth as the Skate rose. Otherwise the room was deathly quiet. A wrong move or a miscalculation would endanger the mission or even the ship. Calvert continued to peer through the eyepiece. When the top of the periscope came within sixty feet of the surface, he spotted heavy ice to the side. He flipped the prism to look straight up, but saw nothing except the same blurred aquamarine. Sweat appeared on his forehead as he felt all eyes in the control room bear down upon him. If the sub rose too slowly, it could drift away from the opening. If it rose too quickly and struck ice, the collision could tear open the pressure hull and send the sub and all ninety men on board to the bottom. … The submarine’s black hull stood out in stark relief against the deep blue of the calm lake in which the ship now floated. Beyond the lake, stretching to the horizon in every direction, was the stark white of the permanent polar ice pack. The officer who had climbed to the bridge with Calvert called the skipper’s attention to the port side of the ship. There a full grown polar bear was climbing slowly out of the water and up onto the ice. Lesson: cite the original source. No submarine ever surfaced at the North Pole in the 1930s/1940s. No diesel submarine could go anywhere near that far under the ice. Where did you find that mistaken claim? It’s a bad source and should be flagged as unreliable. Note mentions of the ice when the Skate surfaced– as it says there, very thick and variable; the quote mentions ice at 10 feet and 60 feet below the surface, for example. Polyakov and Johnson 2000; Polyakov et al. 2002…. Exactly. Back at the end of the last century it was thought possible that natural variability was a key driver of the current phase of Arctic sea ice loss. Now, a decade on, nobody serious buys that. Really this game of trying to pretend that the changes in the Arctic are natural, or commonplace in human history is very boring and unproductive. US submarines are being chartered for commercial operations under the ice. — petroleum companies? Who else? “The United States, in particular, denies that the waters separating Canada’s Arctic Islands belong to our country. Because they want to ship through those narrow straits, and would like to drill for the oil and gas …, the US maintains the waters are international and open to anyone. Increasingly, the US is trying to find work for its multi-billion dollar fleet of strategic submarines. Four Ohio-class ballistic missile boats have been converted over to support special opeerations. … US Navy submarines routinely carry researchers involved in private projects sponsored by academics and corporations. It is probable that – if they aren’t doing it already – the American Navy will use some of their underultized submarines to explore beneath the Arctic ice for minerals and energy deposits. There’s the data the climatologists need — being collected no doubt under nondisclosure proprietary programs. Your tax dollars at work for corporate profit. “Germany, Sweden and China are all having good success with a new technology, called Air Independent Propulsion (AIP) for diesel-electric submarines. It eliminates the traditional weakness of the time-proven diesel submarine design – which requires the boat to either surface or use a “snorkel” to vent fumes and draw in fresh air when the diesel engine is employed to operate the sub or to charge its batteries. Diesel electric subs are quieter than their nuclear counterparts, because pumps are required to continually move water through the boat’s nuclear reactor to cool it. A diesel-electric sub simply runs on batteries. Solve the recharging problem, and you have an undetectable submarine for a fraction of the price of a nuclear boat. How good are they? The US Navy leased a Swedish boat, the Gotland, and its crew back in 2005 (http://www.nti.org/db/submarines/sweden/index.html) to try to determine if it could successfully fight this new technology. It wasn’t an idle gesture. The same year, a Chinese AIP submarine surfaced in the wake of the American aircraft carrier John F. Kennedy in the Sea of Japan. The crew of the Kennedy had no idea it was there until it was spotted by the pilot of a landing F-18 jet. Had the Chinese sub had hostile intent, the Navy knew, super-carrier would have been lost. The Swedish sub exercised with the US Navy off San Diego for 24 months (http://militarynuts.com/index.php?showtopic=1453). While the results have never been released, sailors who were involved in the exercises were quoted as saying that the Americans were never able to hear the Gotland, despite operating the most sophisticated sonar systems in the world. #177–Jim, are you suggesting (in light of my links which show observers charting ice in the Arctic in 1934 and in 1953) that it’s even remotely plausible that it was ice-free and not one observer mentioned that fact? Ice retreat, possibly, though to present-day levels is most unlikely. As to ‘submarine pictures,’ don’t even bother. Large leads can and do form at any time in the pack ice, and sub commanders consistently use them (if they can find them) in preference to busting through the ice with their conning towers. And as far as I know, all extent ‘sub pictures’ date from late in the 1950s, after the years in question, anyway. Indeed, there is no way to truly compare ice coverage during the 1930′s to 40′s but the source of that speculation was pictures taken from submarines that surfaced at the north pole with considerable open waters. What was the name of that submarine that surfaced at the North Pole in 1934? And while you’re at it, the name of the sub that surfaced there in 1953? Those are the two dates mentioned by Andrew. I don’t think there is enough data to say such conclusions are justified or to dismiss as “remarkably implausible” but the temperatures in the Arctic during that time were remarkably similar to this current period and the subject of several peer reviewed papers. 1. The Skate never surfaced at the north pole, despite Watts’ claims to the contrary. 3. Hey, look, scattering the ashes of Sir Hubert Wilkins! They’re not swimming! They’re walking on the missing sea ice! 4. Of course, subs do search for leads in the ice, and surface in them at times, rather than bash through. The existence of these leads aren’t a sign of the arctic ocean being “ice free”. I thought this might be misleading so did a little armchair amateur search. On the whole, the conversation about melting has been about the years since 1979 when we have more complete and accurate measurements, but I don’t think one can support the above assertion unless you work hard to exclude any inconvenient data. Although recent acceleration takes a while to be incorporated in the records, even without it this is not correct. The graph I found (ACIA*) appears to be cut off at about 2003 which makes it slightly favor what is IMNHSO a false assertion, but even so it doesn’t look that way if one uses unbiased eyes. If you look only at single years and hide your eyes from the clumps of data, and ignore the last ten years, you can almost support that assertion. But it takes an effort to ignore the surrounding information. *An international project of the Arctic Council and the International Arctic Science Committee (IASC), to evaluate and synthesize knowledge on climate variability, climate change, and increased ultraviolet radiation and their consequences. The results of the assessment were released at the ACIA International Scientific Symposium held in Reykjavik, Iceland in November 2004. As the publications cited were from the early oughts, it might also be appropriate to note that the Arctic warming picture has passed from a less noticeable trend supporting the strong theory supporting warming to obvious with a strong signal in the last 8-10 years. Kevin McKinney@~174, thanks for all the heavy lifting on observations, useful for reality-based community in yet another knuckle-dragging skirmish. Every little thing seems to be used to stoke the fires of the hide your eyes contingent, but we can hope a thoughtful reader or two will take note of this information. About that 4% increase in water vapor, it’s been around for a while (Trenberth) but I’m wondering if there isn’t now a bit more? Hasn’t it grown? Chris Dudley@~163 voices the question we must all be asking – there must be some better ways to quantify how off the wall things are becoming. Of course, we all must realize that absent something we don’t all know about (or the methane shock troops being right, which the science does not appear to support; while faintly agreeing that increased methane can’t be good it appears the more knowledgeable sorts are saying the quantities are out of whack for going all shock-horror on it just yet, while other problems multiply and are bad enough without giving ourselves nightmares), the weather is going to return to something more like normal in the next couple of years. I don’t know how Dr. Hansen nailed it when he said that 2012 was going to be really bad, but it sure is looking that way. USS Skate did indeed surface at the North Pole but not until 17 March 1959. Ice conditions in August 1958 were too heavy at the Pole for the Skate to surface, as they were for the Nautilus some days earlier. The Skate did surface in several other leads and polynya that August, including one near Ice-station Alfa. The above picture may have been from one of those. Remember to read both the article and the first comment correcting the info. USS Skate did indeed surface at the North Pole but not until 17 March 1959. Yes, my link in my post above shows a photo of the ash scattering ceremony referenced in your quote. Looks awfully cold and there’s lots of ice and no open water, just as your quote suggests. With just two links–to the Navy page and to the photograph of the event–this can be corrected. Jim, please, tell us you’ve told whoever misinformed you? Geez, I bet the Navy has scanned in those pen-and-ink tracings from their ice depth finder, which would give a profile of ice depth all along the cruises. Memo: avoid Google for searches if you want facts; they give you a result based on what you have looked for or gone to read in the past — distorted. “… Kwok and Drew Rothrock of the University of Washington, Seattle, recently combined the high spatial coverage from satellites with a longer record from Cold War submarines to piece together a history of ice thickness that spans close to 50 years. “… After the 180-mile sprint was complete, we found a surfaceable feature and punched through. The moment of truth had come. The GPS fix indicated that we were on the exact latitude line the quartermasters had calculated by the hand DR, but the heading error placed us 145 nautical miles due east of that position! That was tough to swallow. In hindsight, I was happy enough just being on the right chart. The Mk-19 Gyro was re-started and provided the heading reference …. Eighteen hours later, we were underway with three separate heading sources working well. We completed our transit of the North Pole while the embarked scientific team accomplished their own goals, dropping 77 under-ice conductivity-temperature-depth probes along our track for collecting data. With the excitement of the scientific mission behind us, the only obstacle remaining was the Bering Strait passage, which would entail traveling submerged 1,000 miles inside the 100-fathom curve with ice pack overhead…. Hmm, the point in my overlong sentence was meant to be, that in the normal course of events, 2012 will become another year out of whack with the trend, just like 1998, unless something we don’t know about is under way. The normal thermostat for identifying the unusual is likely to be adjusted upward. In the midst of all this, the truth remains our only hope. The truth, and a lot of it. It is tempting and even possibly true to say that this is what the beginning of a tipping point might look like, but premature to insist. The stoking of fear has been a weapon of cultists since the beginning. It doesn’t work to join the forces of darkness. The truth is defenseless but unchangeable; one can hope it will prevail in the face of tawdry exploitation. I would rather “hand wave” and be correct rather than “mechanistic” or “statistical” and be wrong. Many scientists are like chess pieces on a chessboard, their knowledge and worldview is based on the given square that they occupy and the squares that they can legally move to. I do not have time now to post a detailed defense of my previous postings with peer-reviewed support until early next week when I fire my next salvo of torpedoes at the erroneous hope that the sea-ice will be around like the models claim. I hope that everybody enjoys Earth Day, and contemplates a world this decade with no Arctic sea-ice. Well, WUWT has been pushing this meme for years, and denying any attempts to point out his misrepresentation. Is this Jim’s source, or just his source’s source? Not sure. But I’m quite sure that WUWT has been the main source of these lies. I’d like to suggest to you Chris that you look at Johannessen’s Fig 1 more carefully. When the model was run with natural variability it captured the 30’s polar warming but not the late 20th century warming. After adding CO2 in Fig 1b, it was too warm but after adding some arbitrary amount of sulfates in 1c they reduced the extreme heat and come closer to the 20th century warming. I find it amazing that they then claim that only after adding greenhouses gases can they replicate recent climate. For those who have not stuck their head in the sand, please notice that the natural warming of the 1930’s and 40’s was eliminated. The real scientific conclusion would be that their models failed to capture the recent and the past warming correctly, and when they approximate one they lose the other. Therefore the model is unreliable and does not faithfully represent reality. The warming of the 1930’s-40’s was natural, and whatever contribution of recent warming in the Arctic by CO2 is only trivial in that context.